THE ST PETERSBURG CRIME DATABASE FUNCTION ON THIS SITE IS CURRENTLY UNAVAILABLE. We set this site up in April 2009. The database worked until December 2011 when we had some hosting problems. Many St Pete people would look at the site, even send in reports as if we were the St Petersburg Police Department. However, there was never any financial support and we don't have the resources to set it up again ourselves. We expected that we would get more support from the people of St Petersburg, FL than it got. St Petersburg has one of the highest crime and violent crime rates in the USA. You get what you deserve. St Petersburg, FL is a crime riddled town in Pinellas County on Florida's Gulf Coast. St Petersburg has one of the highest crime and violent crime rates in the USA. Saint Petersburg is Florida's violent crime capital. Your property, your pets, your children, and YOU are not safe in St Pete. Check out the links with the revealing and unnerving statistics about criminal activity in St Petersburg below. 95% of cities in the US are safer for crime than St Petersburg FL. St Petersburg is #31 for violent crime in the USA. Imagine if South St Petersburg was a city by itself. It may very well be top 10, with a "bullet". St Petersburg has the highest rate of violent crime in Florida. Downtown St. Pete: 8th most dangerous neighborhood in the country for property crime? See our other Web Site, South St Petersburg. Not everyone is going to like it. Crime is up in St Petersburg, but down in Tampa. If you are committed to moving to the Tampa Bay area, you would do much better for safety if you were to live in Hillsborough County. "What are the police doing in my neighborhood?" This is a question that citizens often ask. They see patrol cars parked in their streets, and immediately their curiosity, and possibly their fear, is aroused. Is one of my neighbors in trouble? Is there a fugitive on the loose around here? Has a suspicious person been seen? PLEASE BOOKMARK THIS SITE OR ADD IT TO YOUR FAVORITES. IF YOU HAVE A WEB SITE OF YOUR OWN, PLEASE LINK TO US. Field Specific Search providing a listing of calls - this allows you to search by multiple fields, e.g neighborhood and date, or crime and officer. We recommend this as a starting point. You may want to establish which neighborhood zone number you live in first. Topical and guided search here. Topical search: keyword allows you to enter in any data and records containing thta data will be retrieved. Guided searches are available in blocks that show common values, e.g. an officer's name, or type of crime. Advanced search here. Or just click on Search button with no entry. There is no need to enter in a login or other data. Anyone can search our database. We have set up this web site as a public service resource for citizens of St Petersburg, FL, and other interested parties, such as potential residents, to find out about police activity in Saint Pete neighborhoods. This police activity is frequently a good index to the level of criminal activity, and the type of crime. Consider it as on online police blotter for the SPPD. Unfortunately live police call information is not available so if someone dials 911, you won't see it here immediately. If you wish to find out about police department activity and crime rates in a particular area, we advise you to first go to the St Petersburg Police Department Districts And Neighborhoods page and determine what neighborhood zone that you live in. Then go to the Search St Petersburg Police Department Calls For Service page and use one of the three Search facilities to pull up records for that neighborhood. 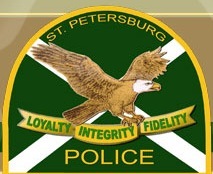 Please let your friends and neighbors know about the St Petersburg Crimes web site. How Up To Date Is The Information Here? We receive the data in the form of a text file called the "Sergeant's Log" from the Saint Petersburg Police Department on the first work day of the week, which is usually Mondays, with a list of calls for the week ending the previous Friday. So you will not be able to look up records more recent than the previous Friday. So, in no way can our service be considered a list of CURRENT events. You may find that searches done soon after we have updated the database do not return all possible results. This is because we run jobs to fully index the new records. It may take some hours for the jobs to run to completion and allow valid searches including these new records to be done. Note at this point, you may find duplicate records on the database. This is because the data sent to us by St Petersburg Police Department can overlap, with some calls reported in one week and also in the next. We are working on fixing this. Our current data is for the period December 12, 2008 through to September 16, 2011. Due to database issues we are only allowing queries on data for the last 30 days. For some reason the Police haven't included data for August 1-2, 2009. If you find other dates missing, please advise us. We also have the data for April 11, 2008 through April 18, 2008 for a special reason. While using this site please check out our unsolved case and contact us if you can help at all. If you have a request for data from a particular period since August 2007, please let us know and we will endeavor to load it for you. This site will feature an unsolved crime here in St Petersburg, FL. This crime will be highlighted here until it is solved. At that time another crime will be added here. If you have be the victim of a crime, and you believe that that crime is a candidate for being shown here, please contact St Pete Crimes. 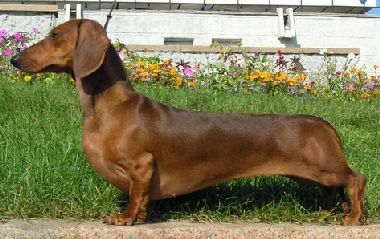 The current crime is the brutal killing of a cat, Amy, on April 12, 2008 by a tall, skinny, black man with a reddish brown dog, most probably a dachshund, on a leash. There is a $4500 reward for information leading to his arrest and conviction. last seen walking South on 23rd St N between Burlington Ave N and 2nd Ave N. at about 12:10 PM. Do you know anyone who boasted of killing a cat, or of the necessity of killing a cat, or who matches the description above and has access to such a dog? He may have decided to dispose of the dog after the killing because it was so distinctive. He may have advertised it for sale or handed it in at an animal shelter. Or he may have moved to another area of the city because of the publicity generated. Perhaps he was walking the dog for someone else. There is $4500 reward money available to anyone who can help close this case. By using this web site, you become a partner in the hunt for the killer of Amy, before he creates his next victim, be that another animal, a child, or a member of his family. This man is apparently unstable with no regard for life. St Petersburg has a population of a quarter of a million people. One of those people is the killer, and at least one of the other 249,999 persons knows who he is. If you are the person who can stop him before his next victim, do the right thing. The St Petersburg Police Department has a clearance rate of between 20 and 30%, i.e. for every 10 crimes reported, only 2 or 3 will be solved. That is about average for law enforcement in Florida and is not as bad as it sounds. Offenders tend to be repeat offenders. If they don't get caught for the first crime, the odds are they will be caught for the second or third. You can help by being vigilant and reducing the crime rate by helping them get caught for their first offence. 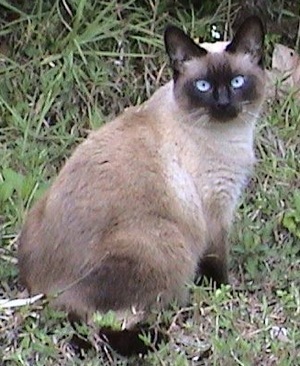 Amy was an 11 year old, 10 pound female Siamese cat. It may have been an act of incredible bravery to beat her with a stick, or the act of a dangerous, cowardly lunatic. You decide and if you can help, please do. We have a Twitter Feed as well :Who Killed Amy? Join the FaceBook Group to say "No" to Crime in St Petersburg, FL and support the St Petersburg Police Department.